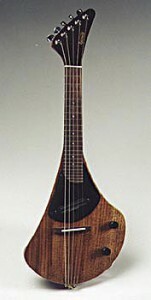 An electric mandolin, pared down to its simplest (and most aerodynamic!) form, LITTLE RED is a modern, solid body instrument carved from a single piece of lightweight hardwood, and reinforced with a graphite epoxy rod. This exceptionally strong and light construction produces an instrument with great sustain, bright tone, and perfect playability. Available in 4, 5 or 8 string models, with arched or flat fingerboard, and a humbucking blade pickup, in a choice of woods (including Spanish cedar, ash, or poplar) depending on desired tonal qualities.